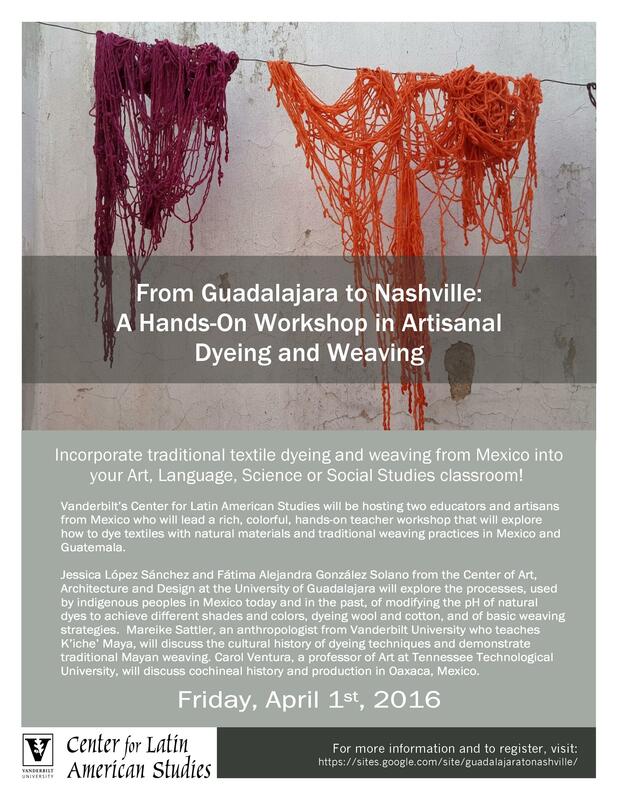 Vanderbilt’s Center for Latin American Studies will be hosting two educators and artisans from Mexico who will lead a rich, colorful, hands-on teacher workshop that will explore how to dye textiles with natural materials and traditional weaving practices in Mexico and Guatemala. Jessica López Sánchez and Fátima Alejandra González Solano from the Center of Art, Architecture and Design at the University of Guadalajara will explore the processes, used by indigenous peoples in Mexico today and in the past, of modifying the pH of natural dyes to achieve different shades and colors, dyeing wool and cotton, and of basic weaving strategies. 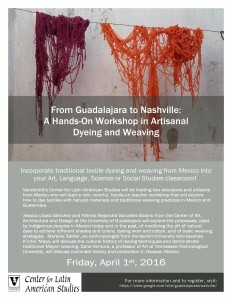 Mareike Sattler, an anthropologist from Vanderbilt University who teaches K’iche’ Mayan, will discuss the cultural history of dyeing techniques and demonstrate traditional Mayan weaving. Carol Ventura, a professor of Art at Tennessee Technological University, will discuss cochineal history and production in Oaxaca, Mexico. Don’t miss this unique bilingual workshop that combines traditional ecological knowledge with fine arts, Spanish language, and cultural studies!